If you think that your garage can only accommodate a little space for other items, maybe a little organizing can transform it into the workspace you are looking for. The clutter from the garage is what is keeping it from being of much use to you – and we are going to put an end to that Most of us know this but will not admit that the problem with having a useful garage is the accumulation of items there. Some of them are needed while some are not. This is where we come in on the aspects in organizing our garage. Here are some of the best tips on organizing your garage. You can start on this by creating three categories for your unused items: toss, donate, and keep. Going through your items and assigning them on each category will give each item a purpose on what should be done with them. If an item is being rarely used, then it will probably make a excellent candidate for the toss or donate heap. Go through your garage and start identifying items that you no longer use as you can give them to other people or throw them away. This is also where a garage sale can be set up which will allow you to get a return on your investments. Assign a location, for each category where they must be kept to minimize confusion. You can have your tools placed on hooks in a pegboard or your sporting equipment in cabinets. Items that are not clearly identifiable should have a clear label on them. Place these items in a plastic sandwich bag and label them using a permanent marker for use later. Instead of using cardboard boxes, go for the plastic storage containers instead. Why? The cardboard can easily bend and dent with frequent use. They can also succumb easily to dampness, which can deteriorate items inside. Plastic boxes on the other hand are waterproof and can be easily shifted around on shelves if they are not too bulky. Having hooks will allow you to hang items such as bicycles, strollers, shovels, tools and a lot more. You can even purchase a hammock and place it in your garage corner to accommodate gear such as basketballs. 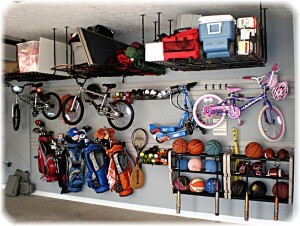 Metal shelving can be installed in your garage to accommodate items and keep them off the floor. Metal shelves are better than wood because they can withstand humidity and heat better. These shelves will also let your items avoid the dampness from the floor. Elevating items off the floor will also give you more space to work around in your garage. You can maximize the storage capacity of your garage by having cabinets built along the walls. The ceiling can have a wooden mount installed which will allow you to hang items such as spare car batteries or tires. Having proper ventilation in the garage is necessary, as many people will be going through here especially if it has many uses. Consider installing additional windows to let fresh air in. Elevating storage for materials that are harmful to health and dangerous power tools are some of things to consider, as well. If you put off placing things back in their proper storage areas, then you are bound to repeat the clutter that you have just started to deal with. It will also make it harder for you to locate the object if it has been misplaced. As a part of organizing and maintaining your routine, put things back to where they belong after you use them. Organizing the garage can open up a lot of benefits for homeowners today. Being able to store equipment that does not have any space in your house can be done here. The garage can also be used as a place where outdoor tools can be accessed easily so you will not have to go inside and outside of the house just to get what they need. Aside from that, the garage is also where you can set up your workbench to let you accomplish some construction work for your home.